The retirement of the Belgian Field Army and the two brigades of the British Royal Naval Division to Ostend was protected by a force at Ghent comprising two Belgian brigades, 8 squadrons of Belgian Cavalry and a brigade of French Fusiliers Marins. The British 7th Division and 3rd Cavalry Division were positioned at Bruges and moved in part to within a few miles of Ghent. During 11 October superior numbers of German troops, these being from the three divisions leaving Antwerp, approached Ghent. In the afternoon the Belgian, British and French flank-guard troops began falling back in a westerly direction via Thourout. The Belgian troops continued to the Yser Canal. The British 7th Division moved to Aeltre, picked up its units still in Bruges and was instructed to move to Ypres. It spent the night of 12/13 October at Thielt. The British 3rd Cavalry Division moved via Thourout to Roulers. The French Fusiliers Marins brigade moved to Dixmuide. The Germans captured Ghent a few hours after the Allied forces had left. It was initially suggested that the Belgian Army should retire to a line St. Omer—Calais over the French border as it was in such need of rest. It had been fighting continuously for almost two months. It was reduced in number from losses in the defence of Antwerp and the abandonment of Antwerp. The subsequent withdrawal to the coast had taken a physical and mental toll on the men. They were very tired. There was no hope of a re-supply of weapons and ammunition now that they were cut off from their stores and arsenals. It was, however, decided that the army should be concentrated in the area Dixmude—Nieuport—Furnes with its base and HQ at Dunkirk in the far western corner of Belgium. For two months and more you have been fighting for the most just of causes: your homes and national independence. You have held the enemy's armies, sustained three sieges, executed several sorties, and successfully carried out a long retreat through a narrow defile. So far, you have been alone in this tremendous struggle. Now you are at the side of the valiant French and British Armies. It is your duty to uphold the reputation of our arms with that spirit of tenacity and bravery of which you have given so many proofs. Our national honour is at stake. Look on the future with confidence, and fight with courage. In whatever positions I place you, look ahead, and consider as a traitor to the Motherland whoever speaks of retreat, without the formal order having been given. The time has come for us, with the aid of our powerful allies, to drive the enemy from our dear country, which they invaded in contempt of their word and of the sacred rights of a free people. From 14 October the Belgian troops began to dig in a defensive line at the Yser (IJzer) River sector. The French Fusiliers Marins brigade dug in at Dixmude (Diksmuide). The defensive line stretched for 35km (22 miles) from the sea at Nieuport (Nieuwpoort) to the village of Zuydschoote (Zuidschote) about 13km (8 miles) north of Ypres. Two French territorial divisions (87th and 89th) arrived in the area and were moved into position between Dixmude and Boesinghe, where the Ypres Canal joins the Yser Canal. Most of this defensive line from Nieuport to Dixmude was on reclaimed land from the sea (a polder) and much of it was below sea level. The polder was criss-crossed by ditches and watercourses. The water table was only a few feet below the topsoil. The defensive line was established using the only “high ground” in the sector. This comprised two sets of raised embankments rising some 2-3m (6-10 feet) above the flat reclaimed plain. One of these raised set of embankments was formed by the east and west embankments of the Yser Canal. North of the canal's junction with the Ypres Canal it was 14-18m (40-60 feet) wide. The canal was to serve as the front line. The other line was the raised embankment of the Nieuport-Dixmude railway lying to the west of the canal. This embankment was about 1.8m (6 feet) above the level of the flat polder. Three crossings over the Yser Canal and river were at Steenstraat, Drie Grachten and Nieuport. The British Royal Navy provided artillery support from the sea to assist the Belgian left flank. Admiral Hood commanded a flotilla of two light cruisers, two monitors, some destroyers and some French units. This action prevented the Germans trying to use the Yser Canal and river crossing at Nieuport. The German IVth Army advanced to the Yser River having captured Bruges on 14 October. Ostend and Zeebrugge were captured on 15 October as the German Army made its way towards the port of Dunkirk. The Battle of the Yser, the name given to the battle between the Belgian and German forces, formed the final phase of fighting in the “Race to the Sea”. After several days of fierce fighting both sides were exhausted. The Belgian defenders made a decision to open the sluice gates at Nieuwpoort so as to allow the tidal seawater to enter the flat reclaimed land between the banks of the Yser River and the Nieuport-Dixmude railway line. By deliberately flooding this land it was hoped that the German plans for a breakthrough here would be stopped. A complicated procedure was planned to open manually the gates of the system of locks at Nieuport, called the Ganzepoot (Goose Foot). The gates would be opened in conjunction with the timing of the tides and the action of the the wind. Over 20 drainage culverts through the railway embankment were blocked up and the preparations for the deliberate flooding were begun from 21 October. At high water on the evening of 28 October, after an unsuccessful attempt the previous night, the Belgian engineers and lock-keeper Hendrik Geeraert opened the gates of the old Furnes lock at Nieuport. This allowed the sea to inundate the land between the western bank of the Yser and the embankment of the Dixmude—Nieuport railway. In spite of the rising water levels the Germans continued to make attacks on the Belgian line but by 31 October 1914 the Battle of the Yser and the possibility of any further German advances was over. King Albert moved his headquarters to De Panne where it was to remain for the duration of the war. The German Army subsequently held occupied territory along the Belgian coast from Zeebrugge to Nieuport for exactly four years from October 1914 to October 1918. During the occupation the Germans fortified the sandy coastline. As the most northerly part of Imperial Germany's Western Front, this exposed right flank was vulnerable by its proximity to the sea. They had to protect this flank against the possibility of an Allied invasion from the sea, in defence against British Royal Navy bombardments and bombing by Allied aircraft. 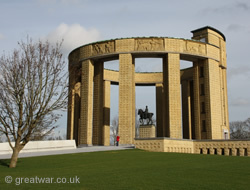 The memorial is located at Nieuwpoort, close to the lock system which was opened to flood the Flanders plain in October 1914.